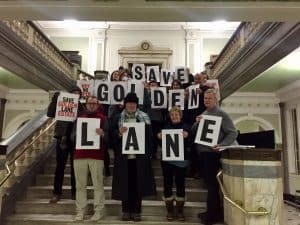 A City councillor has hit out at plans to move the Golden Lane Estate office in with its new community centre, accusing planners of ‘trashing’ the listed estate. Cripplegate ward councillor Sue Pearson made the remarks after the City’s planning committee green lit a controversial proposal to relocate the management office to the recently refurbished community centre, where there would be shared office space and staff facilities. Under additional proposals, the existing management office on the ground floor of Great Arthur House would be converted into three new social housing units, one of them the first fully accessible affordable home in the Square Mile. There were more than 30 objections to the proposals from residents, who said that while they are not opposed to more social housing, argued the community centre office is too small to accommodate the estate management team, and rationalising services would compromise their efficiency. Architect and Golden Lane Estate Residents’ Association chair, Tim Godsmark, argued that the designs for the new flats would provide substandard accommodation and that one of them failed to meet ceiling height guidelines laid out in the London Plan and could never be built. Nonetheless, councillors approved the proposal to merge the two offices by a narrow 13 votes to 10, while the new social housing scheme received stronger support with 16 votes for and five against. Ms Pearson, who addressed the planning meeting on 11 September but could not vote as a resident of the estate, said the committee’s decision was the latest in a series of poor development decisions for sites in and around Golden Lane. “The City of London’s planning committee continues to trash our wonderful listed Golden Lane Estate,” she said. “In a period of 10 months it approved two over-scale, dull developments on the north and south sides of the estate, which will overshadow our homes. Bassishaw ward councillor Graeme Harrower raised the issue again at Friday’s community and children’s services committee meeting, questioning the legitimacy of using planning measures to push through an application that “the great majority of residents do not want”. “The community centre refurbishment was granted with a guarantee that there were no plans to move the estate office there,” he said. A spokesperson for the Corporation said the committee would consult further with residents on improving the plans. 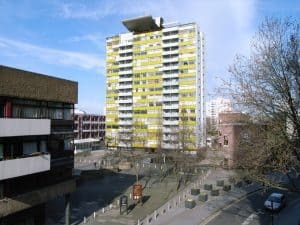 “The City Corporation will also look to see if there are viable alternatives for the relocation of the Golden Lane Estate office,” the spokesperson said. Cover image by secretlondon123 (Creative Commons).